There is something so crisp and clean about blue and white weddings. Reminiscent of winter and the chill in the air with the turning of the seasons to spring. Appropriate symbolism for the beginning of a new life together as husband and wife. This beautiful wedding was held in the new chapel at Ashelynn Manor. 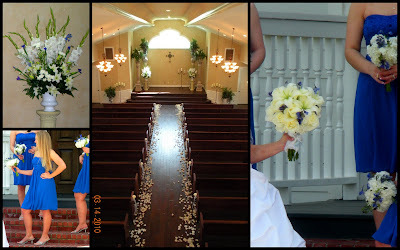 With the feel of an old southern church and the clean contemporary decor makes this a gorgeous place to say your vows. The dark wood accents in the chapel are the perfect backdrop for gorgeous florals to truly stand out and make an impact. My favorite part of this wedding were the rose petals used to line the aisle. It created a beautiful soft line to mimick a "visual" aisle runner without the addition of fabric. We love working with our brides. It is truly our favorite part of everyday, and makes working every weekend so worth it.